Running a race and supporting charity is obviously a win-win situation. Therefore, I decided to sign up for the Singelloop in Utrecht a few months ago, since they’re donating a percentage of the race money to the Dutch Arthritis Foundation (Reumafonds). I was quite happy to see that I didn’t have to get up early for this race. The 10k distance didn’t start until 13.30 and the last starting wave (including me) didn’t start until 14.15. Which meant enough time to get ready in the morning and travel to Utrecht. I was planning to go by public transport, but since the racing route was blocking part of my route to the starting line it seemed easier to go by car and walk from there. The start went pretty smooth since the 4000 runners were spread out over 8 starting waves, but soon I felt like I wasn’t going fast enough and constantly out of breath. Around 3 kilometers in I looked back and couldn’t see anyone behind me, but also struggled to keep up with the people in front of me. At the same time being very annoyed with myself for being last, why wasn’t I moving any faster? At kilometer 4 I could see around five people behind me, but at the same time couldn’t believe I was just 4 kilometers in, it felt more like 6 or 7. As I kept going I also become more nauseous. When I reached the 6 km sign I looked at my watch and realized I actually wasn’t going as slow as I thought I was. I was around 40 minutes in and had already reached the 6k mark and once in a while I was even able to pass someone. I realized that the people which would have run my pace had probably decided to run the 5k instead and thus the faster runners remained for the 10k race. Hence why I didn’t see that many runners around me, but that didn’t mean I was going slower than normal, the 10k group was just a little faster than I was used to at other races. Still I kept struggling a bit, which surprised me since the Kew Gardens 10k race went so smoothly. But despite the struggling I did manage to beat my Kew Gardens time by around 30 seconds and ended up with a new PB of 76:29. 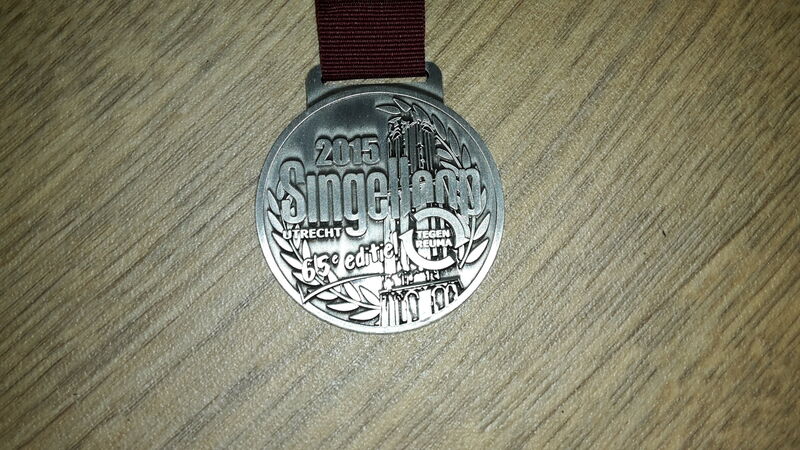 So not bad, but I could have enjoyed the race a little more if it would have gone a little smoother. The marshals were great, but I think the route could maybe be better. I’ve run a race in Utrecht before and liked that route a little better, but at least they managed to have one 10k route instead of multiple laps. And they managed to raise over €60.000 for the arthritis foundation, which is fantastic!